This entry was posted by Jen on December 13, 2009 at 5:24 pm, and is filed under Pets. Follow any responses to this post through RSS 2.0.You can skip to the end and leave a response. Pinging is currently not allowed. 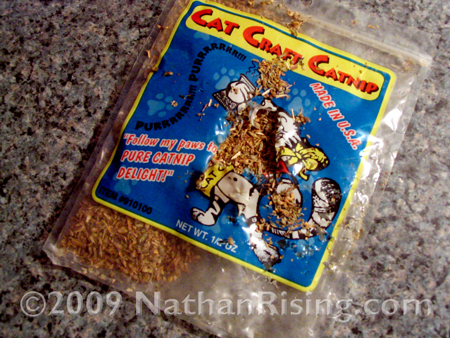 Ah, yes…first it’s “just a sniff,” and then you’ve got full on ‘nip freak-out going on. I think you will need an intervention. And perhaps some sort of Kitty Klean-Up Detox Camp. Does it help if I tell you that this made me laugh? No? Oh. .-= Falling´s last blog .. =-.